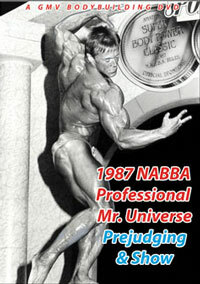 1987 NABBA Professional Mr. Universe: Prejudging and Show. BIG STARS WITH THE FANS: Olev Annus (Finland), Jeff King (U.S.A.), Andre Maille (Canada), Bob Reis (U.S.A.) and Alfred Krautgartner (Austria). For the first time in NABBA history the Professional Class was held on a separate day at a different venue to the 1987 NABBA Amateur Mr Universe in London. This year take a center front row seat as 15 magnificent muscular marvels pit muscle against muscle at the 1987 NABBA Professional Mr. Universe contest in Yorkshire, northern England. The date was 26th September, 2 weeks after the NABBA Amateur Mr Universe. This premier bodybuilding competition was sponsored by Super Body Power, who generously put up the £17,000 (US$35,000) prize money as a fitting reward for the top competitors. This was a very considerable amount of money back in 1987. They also sponsored a Super Body Power Pro-Am contest as part of the same event for amateurs. This Pro-Am event was never released on video. Former IFBB star and recent NABBA Mr World, OLEV ANNUS of Finland waged an intense battle with awesome JEFF KING of USA, and came out on top as the sensational and hard fought winner. Jeff was Overall Amateur Mr Universe in 1983. To see the JEFF KING SEMINAR & POSING DVD, GAMM-009/010DVD. Another sensation for the sellout audience was Austrian star ALFRED KRAUTGARTNER of the "skunk-cut" hairstyle, baring his superb, striated glutes, moon pose style! We had assistance on the camerawork from the 3 other house cameras making this a 4 camera shoot. This displays in mind boggling quality the world's greatest NABBA Pro physiques in the highest quality contest video we had offered to this time. The video also includes all the dramatic comparisons at the prejudging, plus interviews and candid back stage pumping footage. 2 full hours of outstanding contest action. * THIS DVD WILL PLAY ON ANY DUAL SYSTEM NTSC / PAL DVD PLAYER AND TV.